Many writers — native English speakers and nonnative speakers alike — are confounded by uncertainty or confusion about usage, the complicated issue of what, exactly, a given word means regardless of its practical or official definition. Here are some questions and comments Daily Writing Tips readers have sent me about definitions and connotations, along with my responses. 1. One of the words I hear all the time, which I believe is improperly used, is hopefully, as in “Hopefully, we’ll be successful.” I’d love to hear your thoughts about using this word — hopefully, you’ll agree with me. For better or worse, in the usage you abhor, hopefully is firmly established, and employment in its original sense (“in a hopeful manner,” as in “I waited hopefully for her response”) has all but disappeared. The only thing one can do to curtail its use is avoid using it oneself, but this is a case in which the people have spoken: The new sense will prevail. 2. For the past few years, I’ve been noticing the use of “only ever,” as in “I only ever stay on the weekends.” Isn’t ever unnecessary and perhaps incorrect? Yes, ever is an extraneous intensifier. It’s not incorrect, but it should be avoided in formal writing. 3. May “Thank you for correcting me” sound ironic in Modern English? I once used it and got negative feedback. And I think it has pejorative connotation in English, though in my mother tongue it’s just a way to express gratitude or thanks. Yes, “Thank you for correcting me” looks perfectly neutral, but it’s not: In English, the notion of correcting someone has a negative connotation, like being criticized or scolded, and someone who receives that comment from you may assume that you’re resentful for the assistance. My own sense (down here in South Africa, at least) is that this has gone the way of “Thank you for correcting me” and has developed an unintended sharp edge. What is your take? 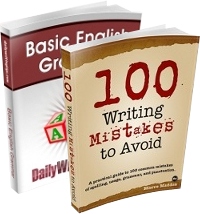 I want to congratulate the people behind “Daily Writing Tips” because they have helped me a lot to discover, improve and practice the English language in a very practical way. 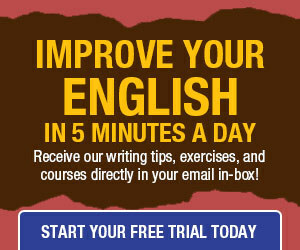 Thank you so much for helping me to improve the process of learning and teaching English as a second language. What are your thoughts on the word aggravate? I find it highly annoying when I hear someone say, “That really aggravates me.” Unless I’m mistaken, aggravate means to make something worse, like a situation or injury. In my estimation, a person cannot in fact BE aggravated. And regarding “thank you for correcting me,” it is always amusing to me when certain phrases are automatically assumed to be sarcastic, whether written or spoken, which I believe is the case here. Unfortunately, that is something often lost on people who speak English as a second language. I have a question unrelated to your particular examples. When did we start dropping “of” after the word “couple,” as in “I went to China a couple years ago?” I find this jarring usage even on the editorial page of my local newspaper. Listen to any newscaster and you’ll hear the word absolutely, over and over and over. I haven’t noticed this about kindly, but it’s a sad state of affairs when politeness is confused for sarcasm. I admit that I used couple this way until a couple of years after I graduated from college — but that was more than a couple of years ago. It’s convenient — and forgivable — to elide of in speech, but don’t omit it in writing. Maybe it is due to being from a different region or having different “experiences” but I have never found “Thank you for correcting me” to have a negative connotation. Maybe it is because I work with foreign speakers learning English, but here I think the problem lies with the person who cannot accept a thank you graciously rather than the person offering it. Obviously if said “Sarcastically”, it would not be well received but someone genuinely thanking someone for anything should receive a “your welcome” not a rebuke. Thank you should always be in vogue if offered sincerely. I’m with wenddex on “aggravate”. Some use it when they mean “irritate” or “annoy”. However this does not irritate me as much as the use of “impact” as both noun and verb. I have even seen a new adjective, “impactful”! Recently I watched an Alan Bennett play performed by the National Theatre in London: beautiful writing and not an “impact” to be heard. Re: Aggravate: My grandmother, who came to the US from Poland as a teenager probably soon after WWI, had to learn English here, of course, and she always used to say things like “It’s aggravating me” or “I’m getting aggravated.” It’s not one of my go-to words, but I still kind of hear her cute voice when I hear that word, and I miss her. So I might use that word incorrectly only because when I use it, I am sort of bringing a little bit of her back to life. Re: Hopefully: I have given up on ever seeing that word used as it “should” be. Time has marched on with that one. I have read of a certain seven-letter word that starts with “f” being described as “a meaningless intensifier”. Holy cow! That description surely hit the nail on the head! The phrase “off of” as in “I got off of the bus,” is deeply entrenched in American and Canadian English. It has been with us for a very long time. “Off of” is an idiomatic part of American English, and it will remain. Attempts to explain it are futile. As “the Borg” said in STAR TREK: THE NEXT GENERATION, resistance is futile. It has already been assimilated. I would not be surprised to find that “off of” is in wide use in Australia, too. American and Australian soldiers, sailors, and airmen learned a lot from each other while fighting side-by-side during World War II, the Korean War, and the War in Vietnam.